A Muslim association in the US is using billboards in Florida to troll Donald Trump, replicating his famous ‘Make America Great Again’ slogan, but with a twist aimed at opening a narrative of inclusion and dampening divisive rhetoric. 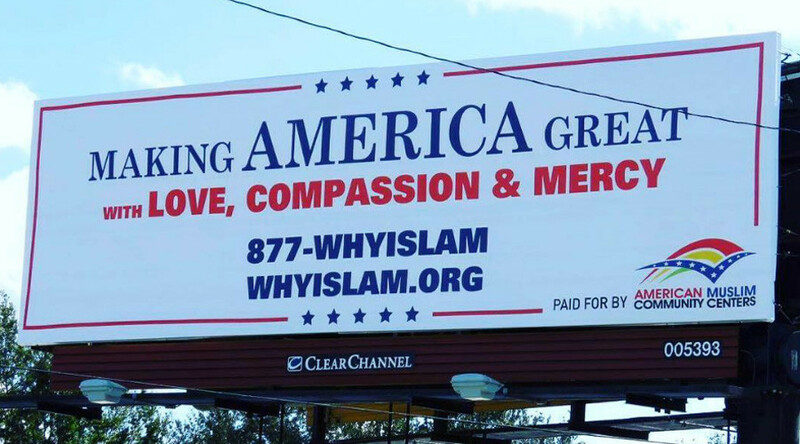 “Make America Great” is printed in large text on the two large billboards, followed in a smaller font by “with Love, Compassion and Mercy,” along with a phone number and web address for whyislam.org. The billboards are described as a public service announcement to remind people of the good work of American Muslims in local communities, as reported by CNN. Last week the AMCC announced the opening of a free health clinic open to lower-income residents in Orlando. “Our goal is to serve humanity – no strings attached. Everyone is welcome,” Chairman Atif Fareed told the Orlando Sentinel.